Summer in Greece... Feel the refreshing Cycladic breeze under the shade of the palm trees that dominate the pool area. The clear waters are inviting you to enjoy a nice, cool dip and the wooden sun-beds promise a comfortable session under the famous Greek sun in Naxos Island. 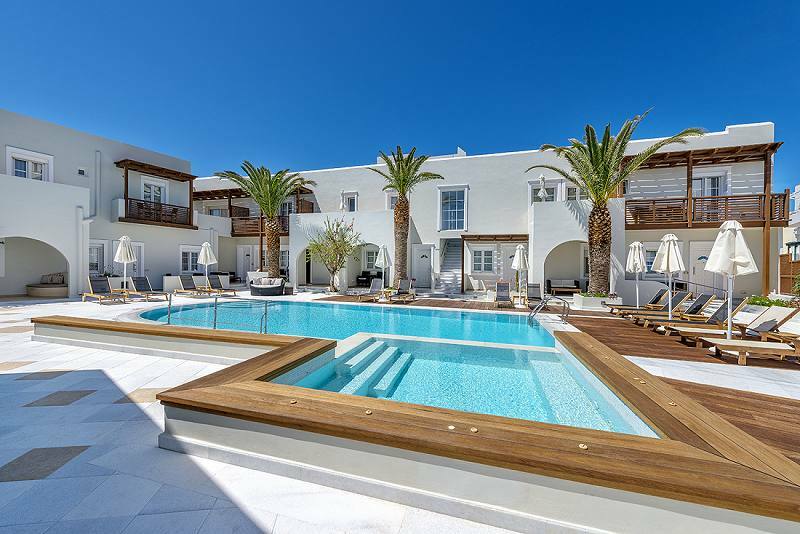 Nissaki Beach Hotel, just few minutes walk from the main town of Naxos Island, features the nicest pool with a hydro-massage area for up to 8 people, near the beach of Saint George. 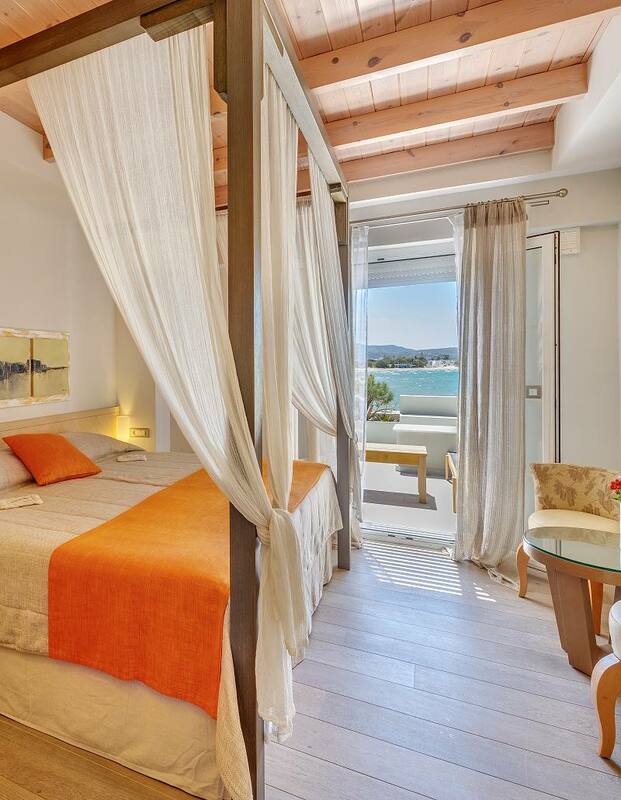 Totally private and with a serene ambiance, it simply promises the most relaxing summer holidays in Greece. The seaside settlement of Saint George is a breath away from the Town of Naxos Island in Greece. Nissaki Beach Hotel is built almost on the beach and features a picturesque restaurant, which can also be an ideal wedding venue. The unique architecture, a perfect blend of Cycladic tradition and modern touches, instantly impresses visitors, while the impeccable service and the unparalleled hospitality aim at satisfying each and every need and demand. 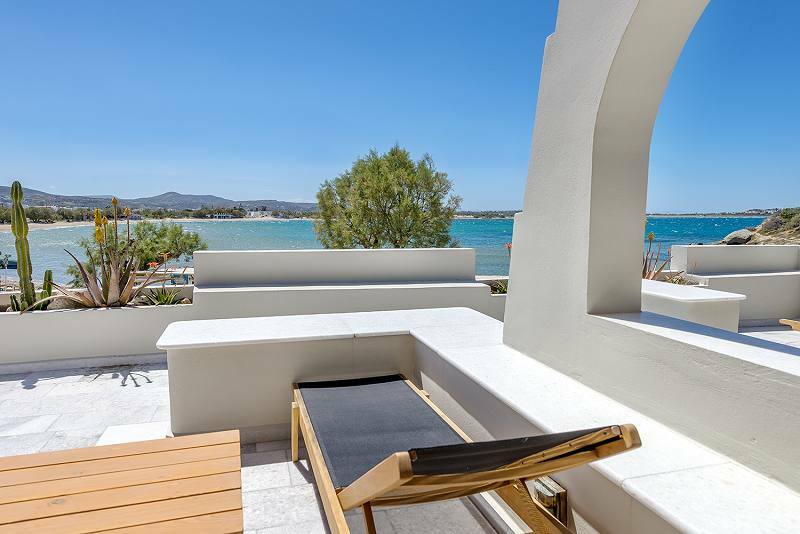 This imposing hotel in Naxos will undeniably bedazzle you with its aesthetics, facilities, services and amenities. 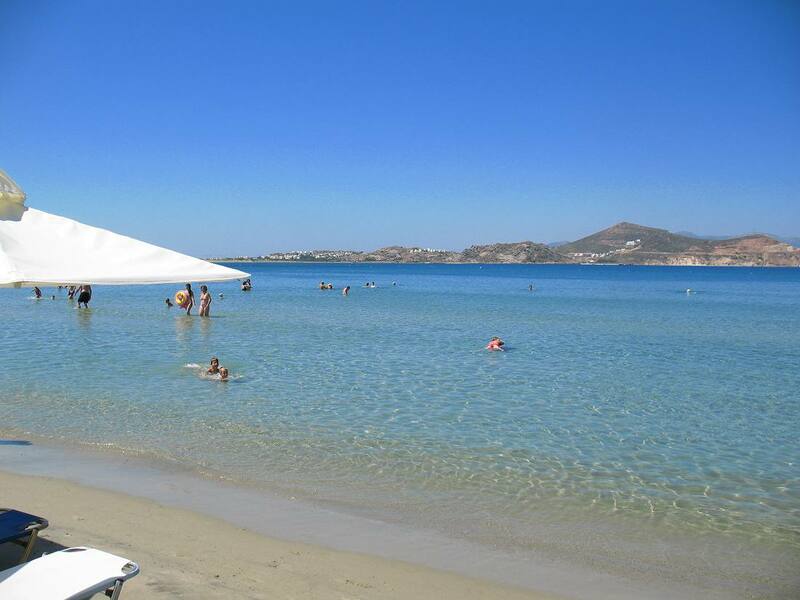 The beach of Saint George is one of the most renowned ones in Naxos Island. Nissaki Beach Hotel features a picturesque, traditional restaurant near the beach. In fact, there is nothing better than enjoying fresh fish and unique seafood delicacies right next to the exquisite blue waters of the Aegean Sea. Taste the perfect combination of creative Mediterranean cuisine with unique Naxian culinary touches in the Nissaki Restaurant. Enjoy freshly prepared dishes with only the finest ingredients, on the idyllic sandy beach of Saint George. Can you think of anything better than a candle light dinner under the stars? 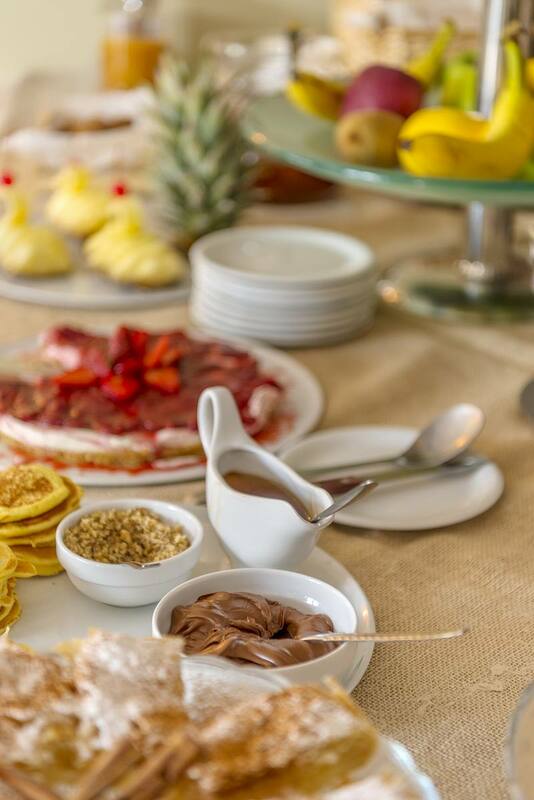 A rich buffet with local and organic products is served daily in the breakfast area of the hotel or the Nissaki Restaurant right on the beach, from 08:00 am till 11:00 am. Enjoy hot and cold dishes, freshly squeezed juices and aromatic coffee and start your day full of energy. The bar of Nissaki Beach Hotel serves delectable cocktails of sheer pleasure. Enjoy your drinks under the sounds of soft music at the indoor bar or the outdoor sitting area, by the pool or even on the beach.